All-natural, non-narcotic, and non-habit forming, Rescue Sleep provides relief for occasional sleeplessness that is safe for the whole family. 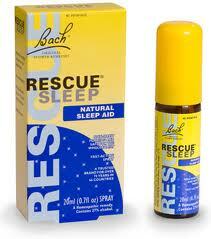 Certain sleep difficulties may be better treated by using one of the other 38 Bach Flower Remedies. Suggested Use: Bring spray nozzle up to mouth and apply 2 sprays onto the tongue prior to retiring. Additional sprays may be taken during the night as needed. Other Ingredients: No artificial colors, artificial fragrances or animal products. Active ingredients made according to the Homeopathic Pharmacopoeia of the United States (HPUS). Warnings: Keep out of reach of children. If pregnant or breast-feeding, ask a health professional before use. Consult a physician for use in children under 6 years of age. Keep away from eyes. Stop use and ask a doctor if sleeplessness persists for more than two weeks. Insomnia can be a symptom of serious underlying medical illness.